In the lead-up to the 15th edition of London's longest running arts festival, we talk to artist-curators Hew Locke and Indra Khanna about this year's sports-free programme. 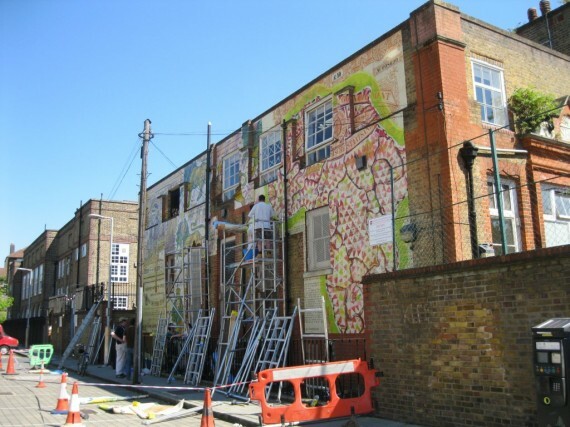 Hew Locke and Indra Khanna have been lead artist-curators for Deptford X these past two years. Their statement for the programme draws heavily on Locke’s creative concerns – decorative art, the baroque, symbols of power and wealth – while also aiming to reach out to as wide a local audience as possible. “The most successful projects integrate comfortably into Deptford’s day-to-day life,” says Locke, “like Adam Vass’s sign for The Bird’s Nest pub. Adam made the work for last year’s festival and the sign is still there now, the pub have kept it up and it’s become part of the fabric of the borough.” Vass’s Sign of the Times (2011) re-imagined the ‘Debtford’ Coat of Arms to explore the impact of benefit cuts and rising student fees on the local community. This year Khanna and Locke have commissioned just four projects – by Henna Nadeem, Dzine, Doug Jones and The Hidden Noise. This pared-down approach has afforded them more time and attention for each commission and has enabled them to be more ambitious in their programming – inviting Chicago-based Dzine to come to London for example. Dzine’s Phenomenon is an elaborate gold sculpture inspired by makeshift bicycles known as Szwaybars prized as status symbols by young people on the Caribbean island of Curacao. London-based Henna Nadeem is another of the commissioned artists. She will be re-working her 2006 Picture Book of Britain for the streets of South East London – collaging idyllic British landscapes taken from Country Life magazines with non-western patterns to create complex, interwoven scenes. The piece, in its new large-scale format, will be installed on an external wall leading from Deptford to Greenwich. Pattern and decoration – and what lies beneath – is at the heart of Locke’s own artistic practice: “Through the nineties and noughties ‘decoration’ was like a dirty word,” he says. “Decorative arts were not cool at all. But it is something I have always been serious about.” Locke’s Gold Standard is billed as the centrepiece of this year’s Deptford X. A temporary installation on public billboard sites develops his recent work with share certificates, through which he explores histories of money, power and ownership. Gold Standard is Locke’s largest outdoor project to date, running 19 metres along two commercial buildings and featuring 15 of his share pieces. In addition to the headline artists, Deptford X features a Fringe of over fifty exhibitions and open studios creating a trail from New Cross to Greenwich. Although the event has been scheduled earlier than usual this year to coincide with the Games, not one of the Fringe proposals Locke and Khanna received related to sport. They hope of course to catch extra visitors as people make their way to the equestrian competitions in Greenwich Park, but the focus of the festival remains firmly on the art. Deptford X runs from 27 July to 12 August 2012.